Choice Privileges has launched a triple miles offer for stays in the United States October 1 – December 31, 2015. You earn base miles of 250 that are triple to 750 during the promotional period. Note that the terms and conditions state that this offer is only valid for the stays in the United States that contradicts with the copy that refers this promotion to be valid for stays worldwide. Not the greater offer considering the value of 750 miles, but may work for those that have cheap stays coming up at Choice properties in the United States. Available to members of the United Airlines MileagePlus program. 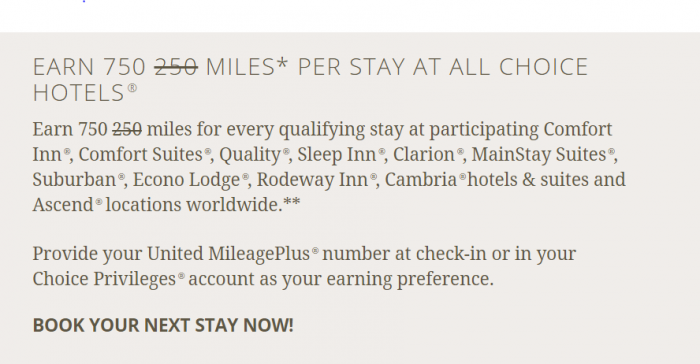 Earn 750 miles for qualifying stays at participating Comfort Inn, Comfort Suites, Quality, Sleep Inn, Clarion, MainStay Suites, Suburban Econo Lodge, Rodeway Inn, Cambria hotels & suites, and Ascend locations for every qualifying stay, with arrival between October 1 – Dec 31, 2015. Offer valid when paying an eligible rate, as defined at www.ChoiceHotels.com at any participating property in the U.S. Valid MileagePlus number must be provided upon check-in or in your Choice Privileges profile for the stay to be eligible. Allow 6-8 weeks for points to post to your account. Standard mileage awarded is 250 miles per stay; a stay is defined as any number of consecutive nights at one hotel, regardless of check-ins or check-outs. For program details and eligible rates, visit www.ChoiceHotels.com.